Head chef Marc Bierkens and his kitchen crew have composed twelve dishes for you. Each refined, absolutely delicious and true works of art. Entice your senses and select your personal menu from among these dishes. You choose one of these as your main course, which will form the starting point for the rest of the menu. Taste it all at Taste! Can we make a taste suggestion? Try our Taste it All menu. In addition to the number of courses you selected we will serve you an amazing aperitif and a matching beer or wine menu hand picked by our sommelier Kees Verlaan, a bottle of water and thee or coffee accompanied by a selection of our homemade friandises. Want to spend the night at the Mercure Hotel Tilburg Centrum after your evening? 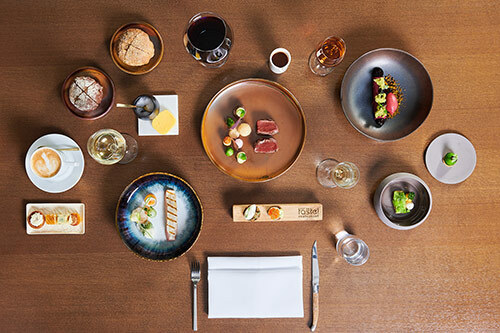 We offer a unique Taste it All at Taste menu combined with a one night stay at the Mercure Hotel Tilburg Centrum for € 129,- per person. This menu exists of a 5 course diner, a one night stay (in a double room) and a deluxe breakfast. Please make sure to make reservations in advance.